During the short television run of the Firefly series, it was not made clear whether the planets and moons depicted were located in one planetary system or many (however, creator Joss Whedon?, as well as all licensed products, confirms that there is no faster-than-light travel in the Firefly universe). The opening narration of the film Serenity makes it clear that the planets and moons are in one system with "dozens of planets and hundreds of moons." This is supported by production documents published in Serenity: The Official Visual Companion. 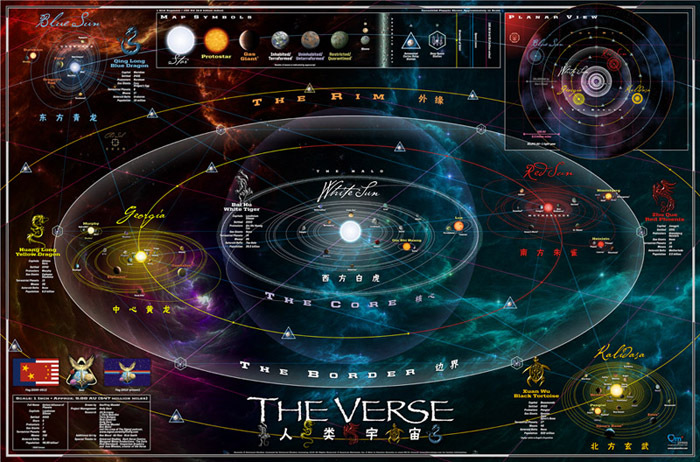 In 2008, a double-sided poster called the Complete and Official Map of the Verse? was produced, which depicts the system as consisting of one central star (the "White Sun") orbited by the "core worlds" and several other stars (each of which has its own planetary system). According to The Complete and Official Map of The Verse, the Verse is also known as 34 Tauri (2020), although it should be noted that the real 34 Tauri is not a star, but an object accidentally cataloged as a star by astronomer John Flamsteed in 1690 which was later determined to be the planet Uranus. 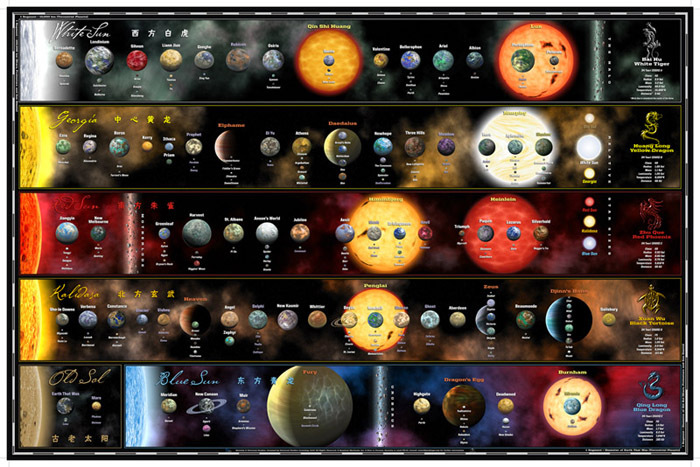 A PDF file titled The Verse in Numbers?, accompanying the map on its official website, and from which the map is based, states that in 2020 Earth astronomers discover that 34 Tauri, up until that time thought to be a single star, was actually a cluster of five stars and several brown dwarfs, and soon numerous Earth-sized planetary bodies are discovered. Plans to colonize the system were underway by the mid-21st century when conditions on Earth became so bad that it could no longer support human life and humanity needed to find a new home. Terraforming technology, tested on Earth's moon Luna and the planet Mars, was eventually developed to a level capable of increasing the surface gravity of a moon-sized body to around 1G (Earth standard) and hold surface water and atmosphere necessary to sustain life. The system has five stars and seven brown dwarf/protostars. All the stars orbit the White Sun, which is a class A0 giant, 2.5 times bigger than Sol and 80 times as bright. The "Central Planets" are the terrestrial worlds that orbit the White Sun. Farther out in this system the Red Sun and Georgia share an orbit, along with the worlds orbiting these stars, referred to as "Border Planets". The fourth star Kalidasa and its planets orbit next. After that, the fifth and last star Blue Sun and its planets orbit. Worlds orbiting these last two stars comprise "The Rim". Planets too far away from the biozones of the main stars are sustained for habitability by a series of protostars. The protostars Qin Shi Huang and Lux orbit the White Sun. Murphy orbits Georgia. Himinbjørg and Heinlein orbit the Red Sun, Penglai orbits Kalidasa, and Burnham orbits the Blue Sun. The number of terraformed worlds in the system is never mentioned in the series though in a deleted scene from the episode "Our Mrs. Reynolds", Captain Malcolm Reynolds mentions to the character Saffron that there are "more than 70 Earths spinning in this galaxy and the meek have inherited not a one." Also, the opening narration of the film Serenity gives us a brief history of the Firefly universe and mentions; "Earth That Was could no longer sustain our numbers; we were so many. We found a new Solar system, dozens of planets and hundreds of moons." All of the following bodies were terraformed and made to have a standard atmosphere and gravity in order to be capable of supporting human life. During the movie Serenity, the planet Miranda is speculated to be a "black rock" – a planet where no life exists or is possible. A generic explanation (that the terraforming did not hold) is offered to explain it, indicating that this simply happened some times while the terraforming process was occurring.